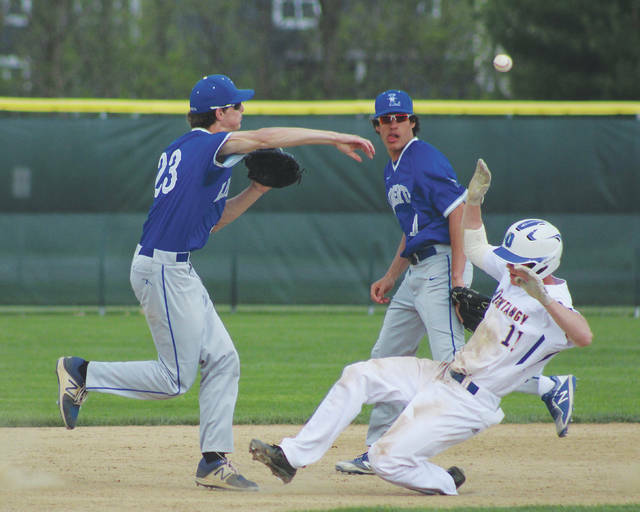 Liberty’s Craig Lutwen (23) fires to first as Olentangy’s Logan Ketron looks to break up the double play during Friday’s OCC showdown in Lewis Center. Justin Nelson drove in three runs and three pitchers combined for a four-hit shutout in Olentangy Liberty’s 10-0 win over host Olentangy in the OCC-Buckeye baseball finale Friday in Lewis Center. Nelson broke the game open with a two-run single in the third and added a RBI double in the seventh to cap the scoring for the Patriots (24-4). It was the game’s only extra-base hit. Brennan Rowe allowed a hit and two walks over four innings to get the win. Jack Metzger gave up two hits over 1.2 innings and Beau Foster allowed a hit over the final 1.1 innings to combine for the shutout. They each struck out two batters. Cole Robinson had two hits and Caden Kaiser walked twice to lead Olentangy’s offense. Evan Brock took the loss for Olentangy (19-9), which had an eight-game winning streak snapped. He gave up two runs on two hits and a pair of walks over two innings. Connor Osmond walked three times and scored three runs, Craig Lutwen had a hit and two walks and scored, Carson Comer had a hit, two walks and a RBI and Mitchell Okuley drove in a pair of runs to help out Liberty’s offense. Both are back in tournament action next with Division I district semifinal games. Olentangy, seeded ninth, plays 19th-seeded Pickerington North at Hilliard Darby Monday and top-seeded Liberty takes on rival Olentangy Orange at Ohio Wesleyan Tuesday. Both games are slated to begin at 5 p.m.
Riley Bruening found the back of the net to tie things up and Khairi Sears scored to give Olentangy a lead it never relinquished on the way to a 16-7 win over Mason in the first round of the MSLCA Tournament Friday at Fortress Obetz. The Braves got off to a bit of a bumpy start, falling behind by a handful of goals in the early going, Mitch Conway, Sam Monastra and Bruening scored to get them back to even. Olentangy, which led 8-4 at halftime, used a 9-0 run spanning most of the second and third quarters to take control — a stretch which included a hat trick from Kyle Milliron. The win sets up today’s showdown with Worthington Kilbourne in the B Bracket Championship. The action is slated to get underway at 1 p.m.
Aidan Kenley and Johnny Wiseman got the Patriots off to a solid start, scoring to make it 2-0 less than five minutes into the game, but the host Eagles held them to just four goals the rest of the way, two in the second half, en route to a win Friday in New Albany. Columbus Academy 13, Olentangy Orange 2; Olentangy Liberty 18, Medina Senior 12. Follow Michael Rich on Twitter @mrichnotwealthy or contact him on at mrichnotwealthy@gmail.com.